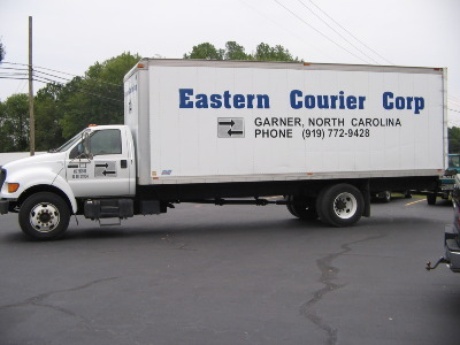 At Eastern Courier Corp, we offer superior shipping and delivery services, as well as secure warehousing, to help you keep your business moving. Our courier services match the capabilities of our competition, but with the added advantage of personalized, local customer care. We’ll pick up your shipment, deliver it where it needs to go, or store your inventory whether you have a one-time request, need a designated schedule, or have a unique situation with complicated needs. Need shipments picked up at the same time every day? Once a week? Trust your deliveries to our friendly, reliable drivers. From mail to pharmaceuticals and everything in between, our trucks can pick up and deliver whatever you need on time, every time. When you need service, just give us a call! We’re ready to make deliveries and pick up shipments whenever you need us. Our reliable, same-day shipping can get your cargo where you need it, when you need it. We offer warehousing services to store your goods safely and professionally, with capacity for any and all of your supplies, equipment, inventory, or anything else you need securely kept in storage. No matter your shipping needs, our experienced, uniformed couriers will handle your cargo with respect and care, ensuring that it arrives at its destination on time and in perfect condition.